The year 1976 was pivotal in the manifestation of the Vidyadhara in the west. He started receiving a whole cycle of terma, which lasted until 1981. These are root teachings which, according to the Tibetan tradition, have been planted in the unconditional realm by Padmasambhava or Gesar of Ling to appear in the mindstream of realized teachers at the appropriate time. 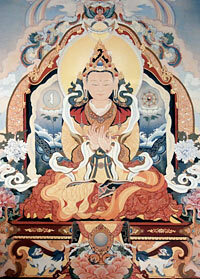 Based on texts received as terma, the Vidyadhara introduced the Shambhala teachings. These teachings as such were not new to him. They had been part of his culture and training in Tibet. But up to that point, he had manifested as a Buddhist master, introducing the intricacies of vajrayana buddhism in the west. He was definitively interested in joining the spiritual and the secular, and in societal issues that transcend the personal relationship between teacher and students. But he had never mentioned, at least publicly, the word Shambhala. After 1976, he started manifesting as a king, setting up his household as a court, and introducing his students to the subtleties of enlightened society. One could see a similar transition in the Sakyong’s manifestation in the year 2003. Although he had received the Sakyong empowerment in 1995 and proclaimed Shambhala Buddhism in 2000, he was seen mainly as a Buddhist teacher. He had put a lot of effort in establishing his basic buddhist teachings, particularly in the 1999 and 2000 seminaries, and with the shamatha teachings. He was also continuing the tradition initiated by the Vidyadhara of bestowing regularly the Vajrayogini and Chakrasamvara abhishekas. Actually some students had concerns about him being too buddhist, and letting Shambhala be “swallowed” by Buddhism. In August 2003, he convened another Kalapa Assembly. The Sakyong presented deep Shambhala teachings there, which came with the proclamation of the inseparability of the highest teachings of Shambhala, the Shambhala terma, and the highest vajrayana teachings, the dzokchen/mahamudra teachings. In many ways, it was really a “Shambhala Vajrayana” seminar. The Sakyong issued a clear statement that from the point of view of fruition, there can’t be any difference between these traditions. Right after that, he went to France for the historical first Vajrayana Seminary in Europe at Dechen Chöling. There he entered a new group of students into the vajrayana path and ended the teachings with a presentation of Pema Karpo a commentary by Mipham the Great on the Seven Line Supplication to Padmasambhava, which is a classical dzokchen teaching. Later in the fall, he taught a Vajra Assembly at Karmê Chöling where his teachings showed many interrelations between the Shambhala and the dzokchen teachings. He also introduced another short practice that he had composed in December 2002, “The Sadhana of Luminosity,” which is a three-root vajrayana practice of Padmasambhava, Yeshe Tsogyal and Ekajati. Later that year and in the beginning of 2005, the Sakyong completed the Scorpion Seal retreat. One of the final terma texts received in 1981 by the Dorje Dradül is called “The Scorpion Seal of the Golden Sun.” This text introduces advanced Shambhala practices. It is the basis for the Werma sadhana as well as the Rigden abhisheka. It contains also the description of a retreat practice. Many times, the Dorje Dradül mentioned that he wanted to do this retreat but for some reasons it never happened. For this retreat to become available to students, it first had to be completed by a sakyong. Many times during the preceding years, senior students had requested Sakyong Mipham Rinpoche to do this retreat. He had finally decided that the proper conditions had been gathered and that was the appropriate time. For that occasion, a special cabin was built at Kalapa Valley in Cape Breton, the land that had been discovered by the Dorje Dradül many years before and recognized as a particular power spot for the Shambhala lineage. As the Vidyadhara said, the secular and the spiritual are one: each depends upon the other. Gesar depends upon Milarepa, and Milarepa depends upon Gesar. This is what we call the Shambhala lineage – not polarizing the sacred and the secular. For truly, if we are to be successful in life, we need to rule the spiritual and the secular. This is known as All-Victorious, an epithet for the Buddha. It is time to reflect on the vast inheritance we have and realize that none of it must be left behind. We are unique because we are mixing the Nyingma and the Kagyü traditions, as well as the terma of the Druk Sakyong, as well as the practices of Gesar of Ling, and finally the Kalachakra tantra. These five lineages have prominent roles in what we call Shambhala Buddhism. In the summer of 2005, at Shambhala Mountain Center, right after teaching the Vajrayana Seminary, Sakyong Mipham Rinpoche bestowed for the first time the Rigden abhisheka to a group of around one thousand students. A gigantic tent was set up. A new one-bowl meal practice was designed. The two-day ceremony was powerful and deeply moving, radiating a white atmosphere of peace and luminosity. In the spring of 2005, rumors and then information had come out that during the performance of Gesar dances at Namdröling monastery, Sakyong Mipham Rinpoche had shown interest in the main dancer. This was the princess, Semo Tseyang, the youngest daughter of His Eminence Namkha Drimed, supreme holder of the Ripa lineage. She and her family were formally invited for tea, and the rest is history. The King had found his Queen. The day after bestowing the Rigden abhisheka, the Sakyong and Semo Tseyang were married in a civil service, presided over by the Mayor of Boulder. Later there was a mandala-wide wedding festival, “Blossoming of the Sun,” in Halifax in the summer of 2006, and a Tibetan wedding festival hosted by the Ripa family in Orissa, India, in the spring of 2007. In August 2008, in Halifax, His Holiness Penor Rinpoche empowered Khandro Tseyang as the Sakyong Wangmo of the Shambhala lineage.